Staircase panel from Foley House. 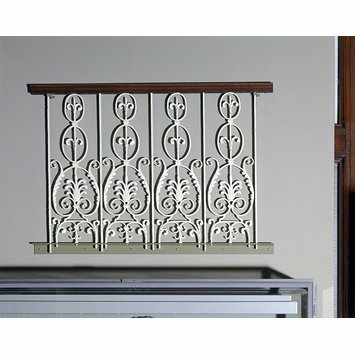 Each baluster is formed of a lower panel containing a palmette and surmounted by two smaller oval panels, each enclosing a pair of crinkled leaves. James Wyatt (1746-1813) designed his home, Foley House, in 1774. Wyatt was Robert Adam's greatest rival and was branded 'the destroyer' by A.W.N. Pugin for his clumsy restoration of many churches and cathedrals. Like Adam (1728-1792), Wyatt designed interiors and accessories as well as exteriors. He later pioneered the Gothic style, but most of his earlier work, like this house near Portland Square, was Neoclassical. According to James Elmes, biographer of Sir Christopher Wren, 'for elegance of detail, for harmony of proportion, for good taste and a chaste suavity of domestic propriety considering its size, this handsome house is not surpassed by any in the metropolis'. There are 13 layers of colour on this baluster. This tells us about the aesthetic choices made by the owners of the house between 1775 and its demolition in 1928. The earliest 18th-century colour scheme was white with gilding to the fleur-de-lis and the leaves. Other colours used over the next 100 years ranged from bronze, green, pale green, light blue, dark brown, green and finally white again, the last a popular shade in the 1920s and 1930s. 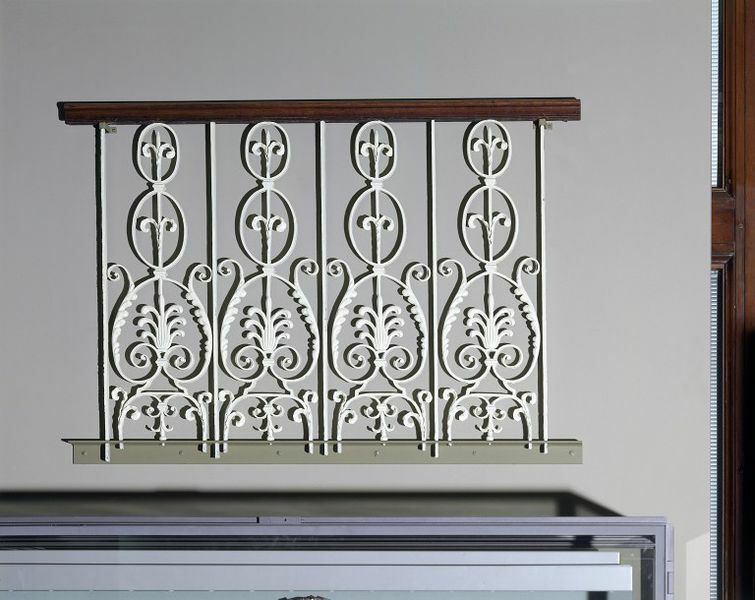 Recently, documents and paint analysis have revealed that the modern fashion for painting ironwork black was not the norm until the late 19th century, either for ironwork out of doors or in the house. 1 Foley Place (previously 69 Queen Anne Street East, and referred to by 1928 as Foley House) was designed by James Wyatt to be his own home and office, and was almost certainly a show place for his skills and taste. Its contents were of sufficient quality that the V&A was offered a selection as a gift when the house was about to be demolished. The demolition was in order for George Val Myer to build Broadcasting House for his client, the British Broadcasting Corporation (BBC). Creating a site of suitable size involved closing and demolishing the western part of Foley Place, once known as Queen Anne Street East and the remains later as Langham Street. The James Wyatt Foley House from which this section of ironwork was salvaged is not to be confused with a much larger house of the same name, which had been very prominent and on a site very near by, but which had been demolished in about 1815. Balustrade from a staircase landing made of wrought iron with brass palmettes and ornamental lead foliage with traces of gold leaf, white, yellow oil size, oil size, bronze paint, green, pale green, light blue, pale grey, dark brown, yellow stone and rust. Part of a staircase from Foley House, Portland Place, London, built c.1774 by the Neoclassical architect James Wyatt (born in Weeford, Staffordshire, 1746, died in Marlborough, Wiltshire, 1813) and demolished in 1928. 1 Foley Place (previously 69 Queen Anne Street East, and referred to by 1928 as Foley House) was designed by James Wyatt to be his own home and office, and was almost certainly a show place for his skills and taste. Its contents were of sufficient quality that a selection was offered as a gift to, and accepted by, the V&A, when the house was about to be demolished. The demolition was in order for George Val Myer to build Broadcasting House for his client, the British Broadcasting Corporation (BBC). Creating a site of suitable size involved closing and demolishing the western part of Foley Place, once known as Queen Anne Street East and the remains later as Langham Street. The James Wyatt Foley House from which this section of ironwork was salvaged is not to be confused with a much larger house of the same name, which had been very prominent and on a site very near by, but which had been demolished in about 1815. Country Life. Oct. 14th 1916. Embellished with brass palmettes and lead foliage. Part of a staircase from Foley House, Portland Place, London, built c.1774 by the Neo-classical architect James Wyatt (1746-1813) and demolished c.1820 to make way for Langham Place.